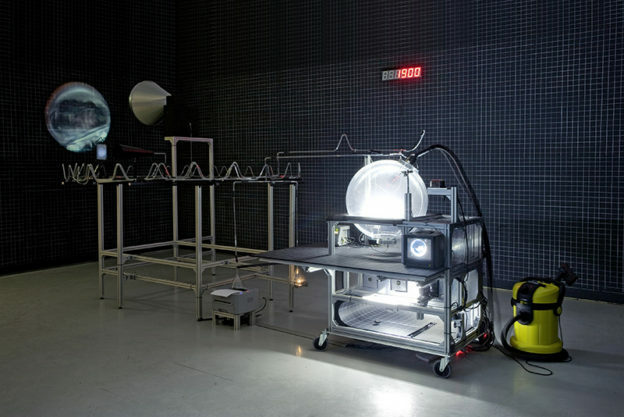 Aesthetics get Synthetic: Knowledge Link through Art and Science (KLAS) is an Artist in Residence program of the Max Planck Society. The innovative artist residency program brought professional artists into high-quality research groups and, by doing so, established a bridge between art, science and society. Knowledge Link through Art & Science (KLAS) fosters ArtSci exchanges and trans/disciplinary innovation and education whilst also creating a link between Synthetic Biology research groups in leading institutions. Agnes Meyer-Brandis is a German artist based in Berlin. Her artistic research leans in the boundary between fiction and science, with a highly poetic approach. Interview conducted by Rodrigo Perez-Garcia, a chemist interested in tangential points of the arts and science, especially within Nanotechnology & Renewable Energy, Interfacial phenomena, Music, Art and Literature (Currently working at the Max Planck Institute for Colloids and Interfaces (Germany)). As co-founder of Polyhedra (www.polyhedra.eu), with Caterina Benincasa, Rodrigo coordinates and implements multi-disciplinary events like KLAS, catalysing connections between local realities and global cultures. 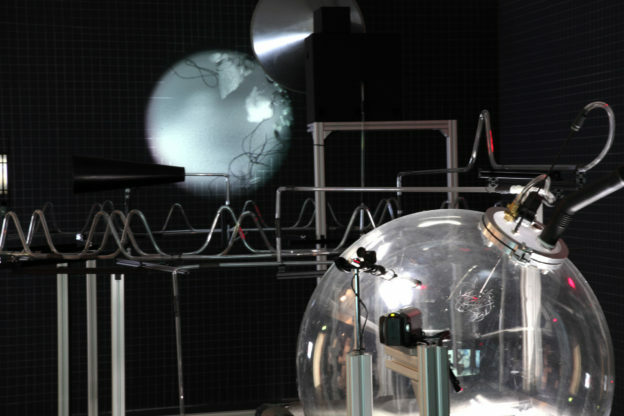 During the KLAS Artist in Residence program Agnes Meyer-Brandis collaborated with Dr Alex de Vries. Question: Which SynBio ideas you find especially intriguing, and which have influenced your art to this date? Agnes Meyer-Brandis: It is too early to say as I am in the middle of process, but Synthetic biology’s ideas and techniques are on the cutting edge between what we can achieve now and whatever is going to come, including all sorts of benefits and risks. In that sense synthetic biology calls up essential new questions and generates impossible worlds by itself. This is fascinating to me, as it seems to match my own work in a strange and ambiguous way that I am exploring. Within the context of synthetic biology it is especially of interest to me to investigate, how much alive my ideas literally can become and what “alive” means. Question: Please tell me about your most recent work. Agnes Meyer-Brandis: Let me tell you one example, as there are several projects running parallel … over the past couple of years my work has been stressing the issues of weather and climate change. Starting out by projects on cloud and rain drop formation and lately developing into works dealing with trees, biometeorology and tree migration. The Teacup Tools are an array of cybernetic teacups, adapting themselves to the realm of climate related sciences. The work appears as a multifunctional tool for the investigation of tiny micro clouds above tea, for communication and for tea drinking. The tea and its clouds are made from anything falling from the sky: aerosols, litter, rain and mass data computation. It is literally boiled by the calculations of the massive amount of collected data that allows to analyse the tea. The sculptures have a nomadic quality. Like parasites they can be found next to aerosol measurement stations, in parks, on streets, on rooftops or in the neighbourhood of research laboratories. 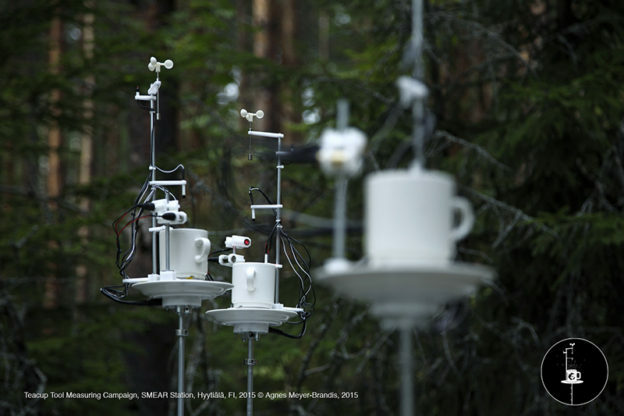 The Teacup Tools call attention to the investigation of the invisible and borderless air and its aerosols – tiny particles of organic and anorganic matter, with a major impact on cloud formation, crucial to weather and climate. Question: Can you talk about your inspiration for Walking tree and How to become a tree for another tree? 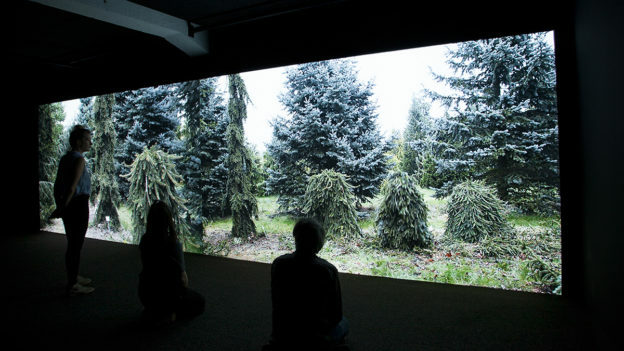 Agnes Meyer-Brandis: Trees are `rooted`. Though long term observations have shown, that forests actually do move throughout the landscape and regions, just very, very slow and over decades. Climate change appears to happen faster than the trees can escape to more suitable areas in order to survive. Scientists are discussing “assisted migration” in order to help speeding up the process of tree adaption. I am discussing, planning and trying to realize a possible system by using options of synthetic biology that allows the trees to move faster and simply walk away from the changed climate. It is interesting to me to investigate and realise seemingly absurd and likely possible and impossible strategies that will allow the trees to wander by themselves in the long run. The inspiration for the project “How to Become a Tree for Another Tree” came during my stay in Finland mentioned above, where I learned that each tree has its own typical Volatile Organic Compounds (VOC) emission. I am fascinated by the idea, that each tree has its own VOC identity and its own cloud. I am thinking how to recreate and synthesize this special ONE TREE ID TM as a perfume and to conduct possible biochemical odour communication experiments with the tree. I could smother myself into this perfume cloud and see how the tree reacts on a person who mirrors the tree’s cloud. Question: What are your impressions about the days at the RuG? Agnes Meyer-Brandis: Intense and inspiring – I am thankful to have met several great and open minded people who shared their time and thoughts with me about each others work and possible walking trees. Alex de Vries and I were working together on a real simulation of migratory molecular trees – and this was a great possibility to dive into each others universe, way of working and thinking. Question: In your opinion how can art connect people to science? And can it help to the advancement of science itself? Agnes Meyer-Brandis: Of course it could happen – but not intentionally, more by accident – as a side product. Art is free and it is important to keep it free from being instrumentalized. Question: What are your thoughts around artists joining a scientific team? 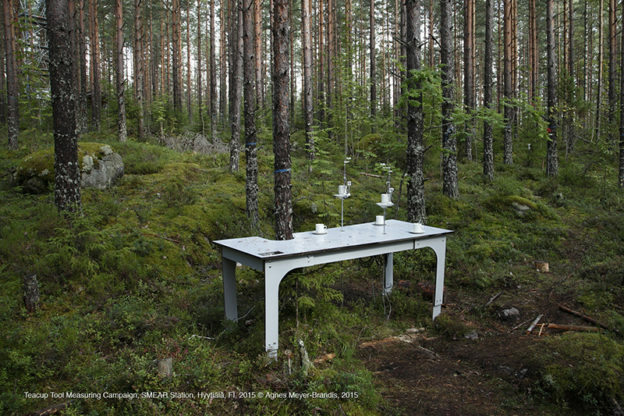 How can we guarantee the quality of the interactions between artists and scientists? Which are the keys to a successful interaction? Agnes Meyer-Brandis: First of all, we cannot guarantee nor control anything …good interaction depends on individual humans and how they like to talk and exchange with each other by free means, curiosity, openness and joy to discover another universe. Agnes Meyer-Brandis: Sure – it has … but it is too early to say what and how. Sometimes a sentence or story of a conversation is the starting point for a long-term project several years later. Agnes Meyer-Brandis is German artist based in Berlin. Her artistic research leans in the boundary between fiction and science, with a highly poetic approach. Meyer-Brandis’ artistic process is a cross between myth making, scientific research, and creating a platform for public discussion about attitudes towards the exploration of new worlds, either real or imaginative. She has received several prices among which the last one in the KLAS @ MPI award. Rodrigo Perez-Garcia is a chemist interested in tangential points of the arts and science, especially within Nanotechnology & Renewable Energy, Interfacial phenomena, Music, Art and Literature. Currently working at the Max Planck Institute for Colloids and Interfaces (Germany), he holds a Erasmus Mundus Masters in Theoretical Chemistry and Computational Modelling (The Netherlands -and Italy) and has conducted research residencies in Bristol (UK), Ispra (Italy) and Kyoto (Japan). As co-founder of Polyhedra (www.polyhedra.eu) Rodrigo coordinates and implements multi-disciplinary events like KLAS, catalysing connections between local realities and global cultures. Caterina Benincasa obtained her degree in Physics and Philosophy (UK) and specialized in Aesthetics & Theory of Contemporary Art (MD), History of Science (MD) and World Heritage Studies (MD). She has been visiting lecturer at the Academy of Fine Arts in Sassari (Italy), researcher in Contemporary Visual Art (France), researcher in Neuroaesthetics at Don Gnocchi Foundation (Italy), and recently worked for the ‘Modern Geometry and the Concept of Space’ research group at the Max Planck Institute for the History of Science (Germany). Co-founder of Polyhedra.eu, In 2013 she co-founded Innovate Heritage, an acclaimed research platform fostering knowledge exchange between the arts and heritage.